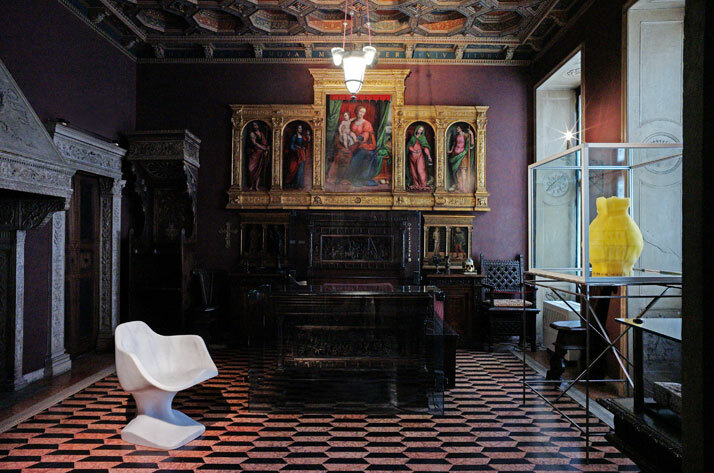 Even though you may have missed the Milan Design week, there’s still a good reason to visit the city: the breathtaking 2.0 Exhibition at the Bagatti Valsecchi Museum curated by Rossana Orlandi, who ten years ago, founded the 'Spazio Rossana Orlandi' in Milan, the aim of which is to promote young and upcoming designers from all over the world. 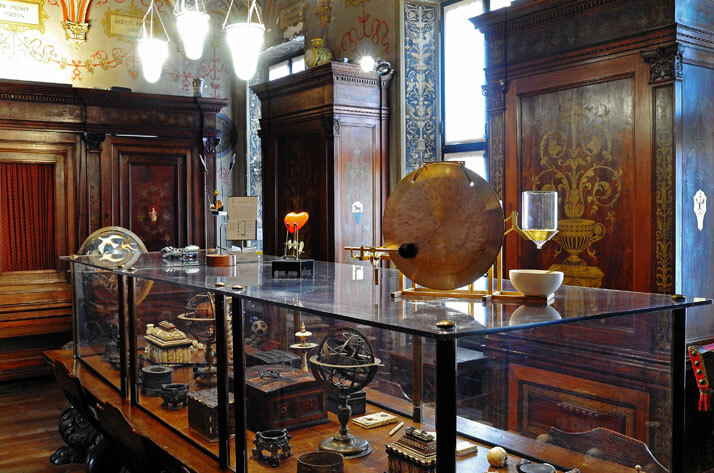 This awe-inspiring exhibition is the outcome of two Landlords and two Ladies, a well thought out collaboration between the spirits of Fausto and Giuseppe Bagatti Valsecchi, the landlords and founders of the Palazzo at the end of XIX century, with Goga Ashkenazi’ patronage who is chairwoman and Creative Director of the 100 year old fashion label Vionnet and Rossana Orlandi responsible for the creative part. 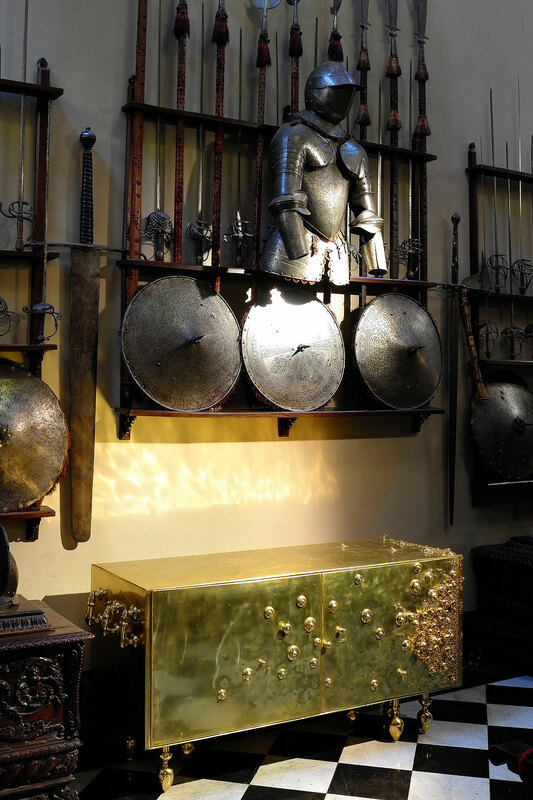 Golden Calf Armoire by Desiree Von Pelt. Photo by Tatiana Uzlova. 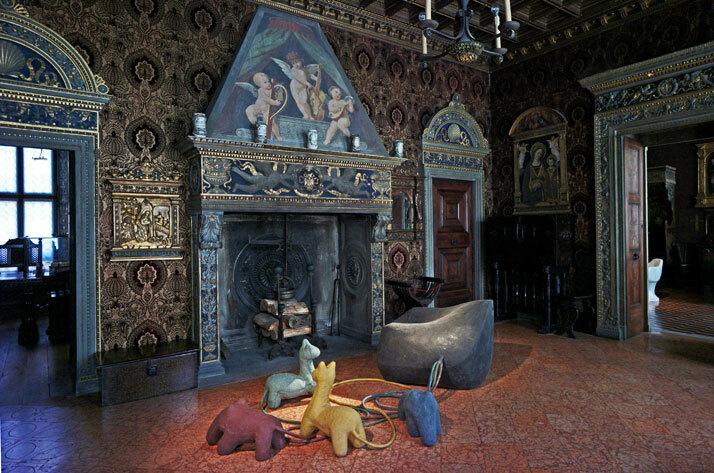 A ‘home inside the home’ curated by Orlandi, located below the Palazzo’s grand stairway hosts and protects all the precious wonders that will fill the Museum Design Store. Built out of light and sturdy iron weft and glass warp, the Store has been designed by Massimiliano Locatelli (CLS Architetti), and is undoubtedly a contemporary masterpiece in the heart of the Bagatti Valsecchi Museum. 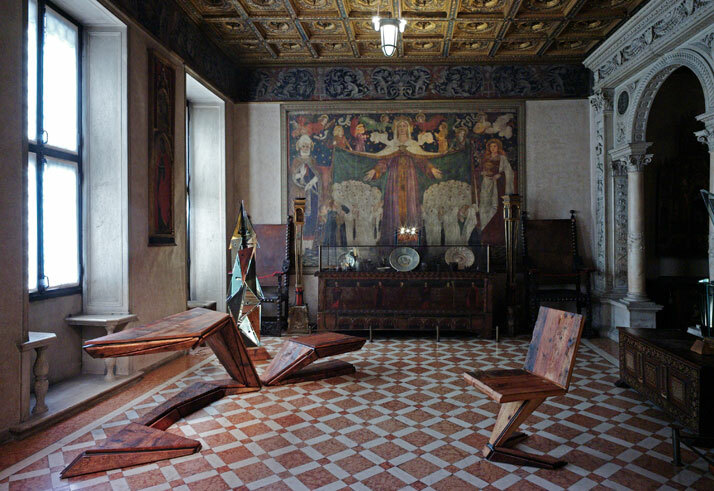 Other substantial contributors included: Flos, Officine Ariotti, SolO Su Misura Arredamenti, Tecton and The photographer's room. 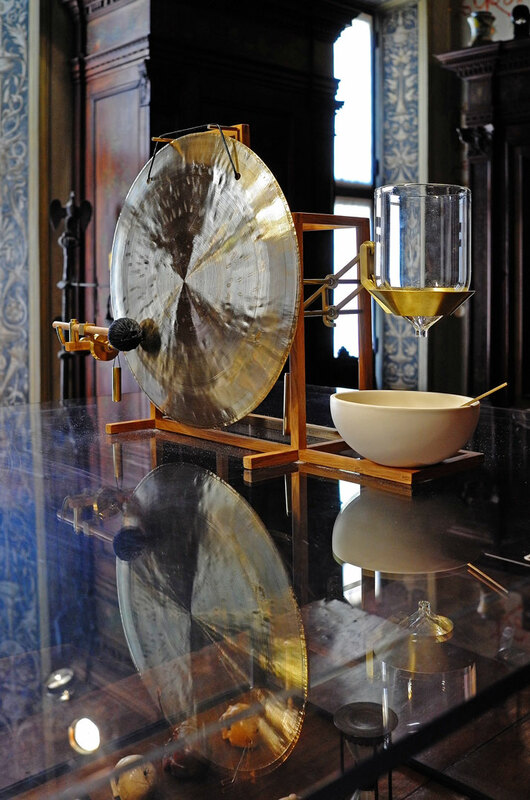 As visitors walk through the Mansion, they will have the opportunity to examine Maarten Baas’ new masterpiece for 'Laikingland' in detail as well as 'Just about now', where the sound of a gong poetically signifies the passing of time. For the Salone del Mobile 2013, the Vionnet fashion house commissioned Nacho Carbonell to design ‘45 degrees and blue’ light installation. And the outcome is fascinating. 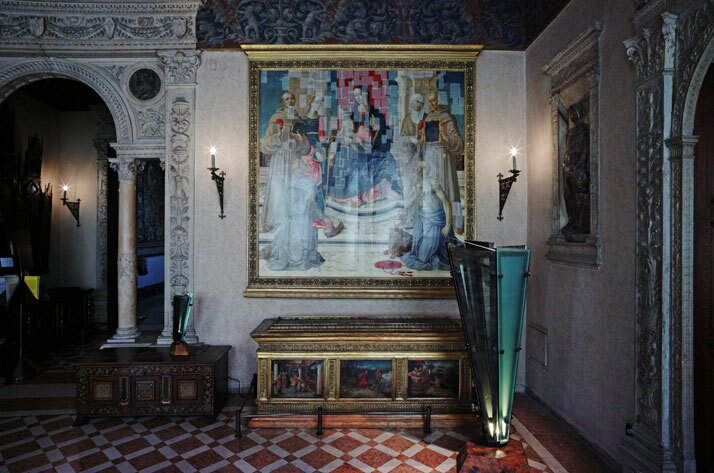 In an attempt to bring more light into the Palazzo, Carbonell developed a monumental chandelier where tubes of silicon with LED lights hang from a metal structure that forms a 45 degrees angle, creating a noble and alluring installation in glaring blue hues. 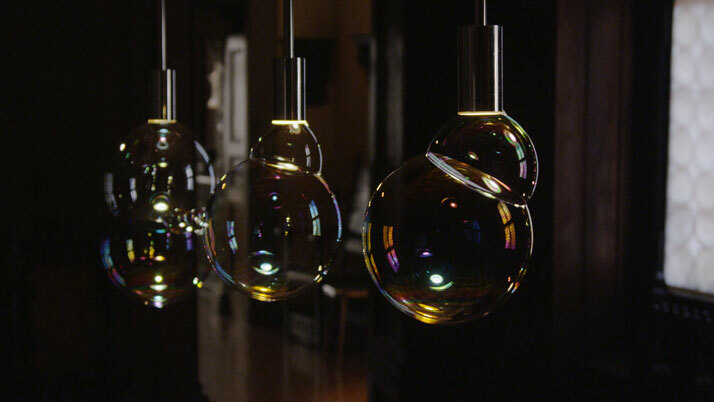 Always inventive, FRONT design studio along with Booo Lab developed the 'Surface Tension Lamp', a humorous and eccentric hymn on the ephemerality of the lampshade that in this case is created by the lamp itself which is nothing more than a soap bubble. Since the LED light source can last for 50,000 hours, each of the Lamps will have 3 million different shades. 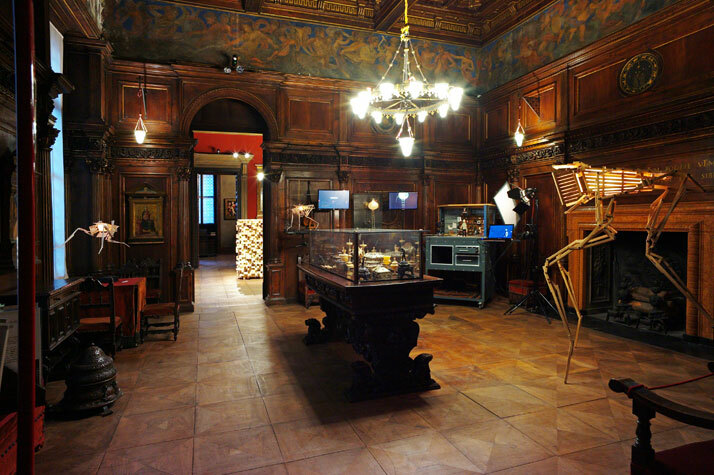 The 2.0 Exhibition at the Bagatti Valsecchi Museum will be on view until the 30th of April 2013, at the Bagatti Valsecchi Palazzo, Via Gesù 5, 20122 Milano, Italy. Surface Tension Lamp by Front Design for Booo Lab. Led Light Producing soap Bubbles. Photo by Tatiana Uzlova. 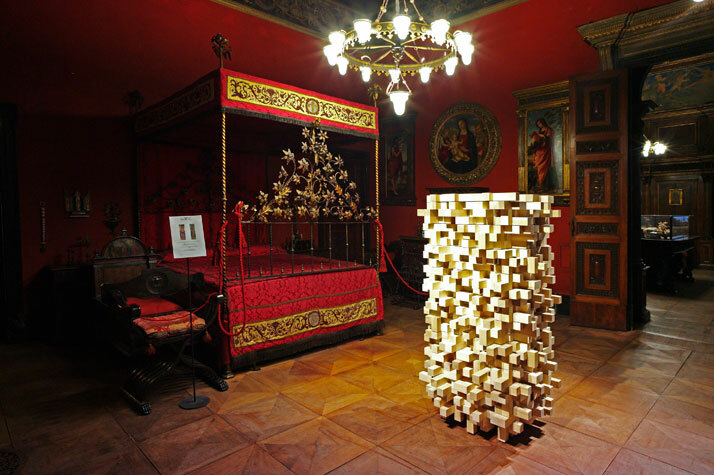 Surface Tension Lamp by Front Design for Booo Lab at Museo Bagatti Valsecchi. Video footage by Robert Anderson. Photo by Tatiana Uzlova. 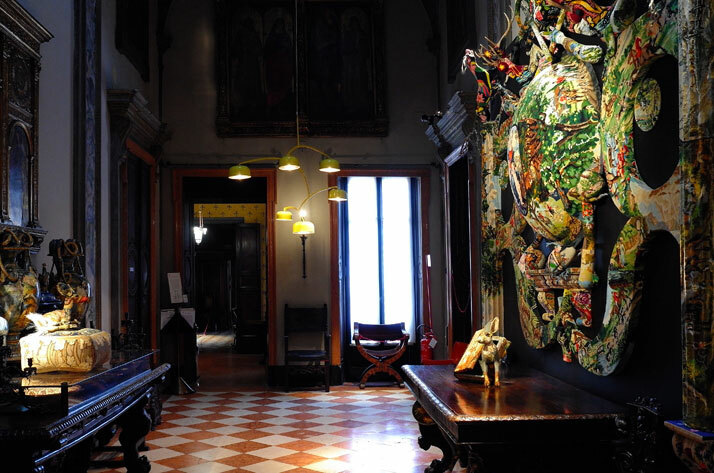 Placed in the astonishing Palazzo in the heart of historic downtown Milan, authentically embellished with 19th century pieces, this exhibition is more than a collection of contemporary design artifacts. 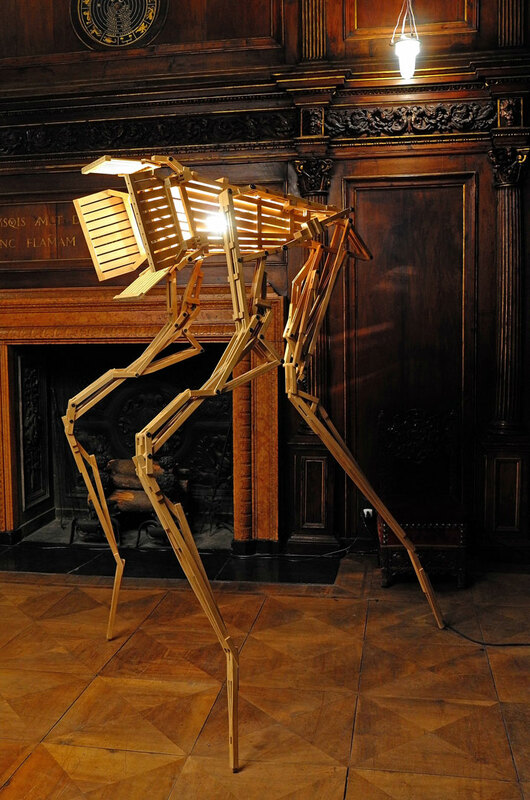 It opens a dialogue between past, present or even future trends, creating a weirdly alluring bridge between them. 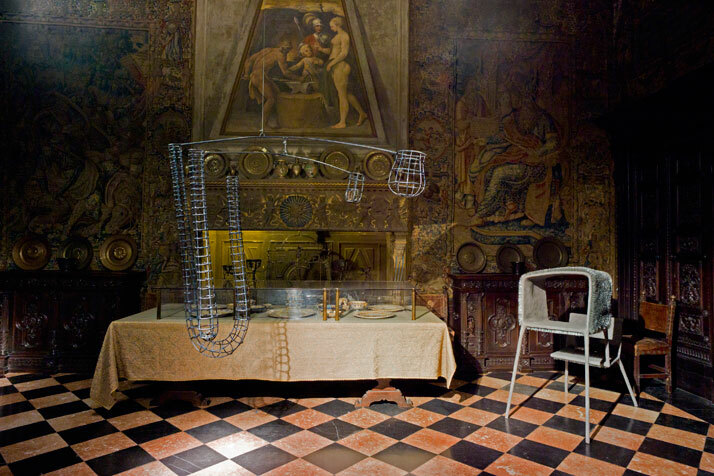 With her discreet arrangement of the design pieces into the already outspoken interior, Orlandi gives visitors the exact amount of space needed to draw their own conclusions on this silent debate of eras. Bust Chair (Marble) by Tomáš Libertíny and produced by Henraux. Photo by Tatiana Uzlova. Hyperion Light by Paul Heijnen. Wood and Metal. Photo by Tatiana Uzlova. 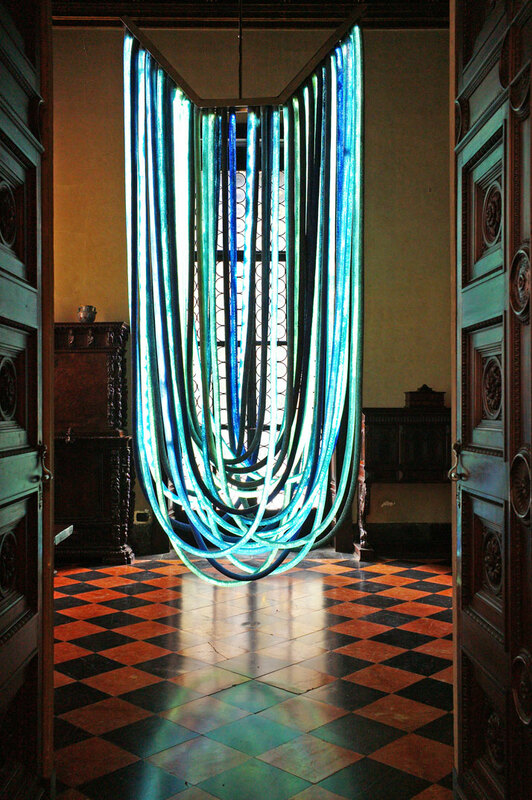 Blue Chandelier designed and realized by Nacho Carbonell for Vionnet. LED, rubber tubes, broken glass. Photo by Tatiana Uzlova. Stop Motion Video by Niels Hoebers. (Rapture Video and Hyperion Light Video). Photo by Tatiana Uzlova. Hyperion Light by Paul Heijnen. Wood and Metal. / Stop Motion Video by Niels Hoebers. Photo by Tatiana Uzlova. 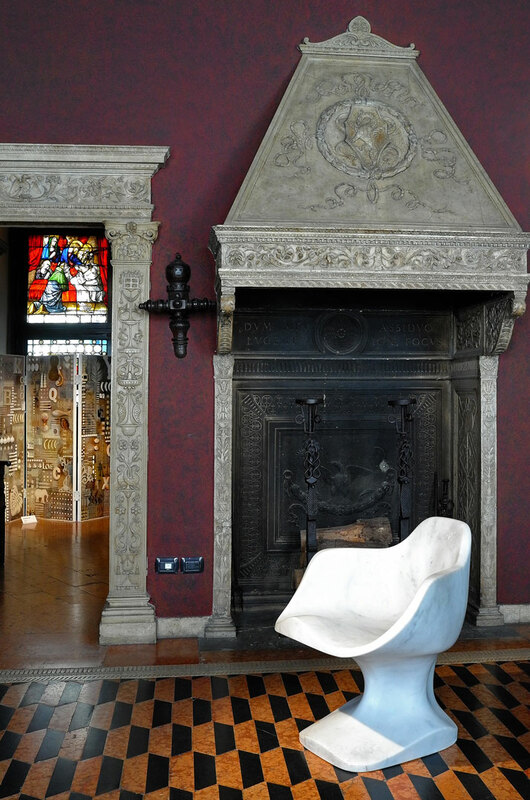 Bust Chair (Marble) by Tomáš Libertíny and produced by Henraux. ''Martha Hertford Vase'' in beewax designed by Tomáš Libertíny and produced by bees. Photo by Tatiana Uzlova. 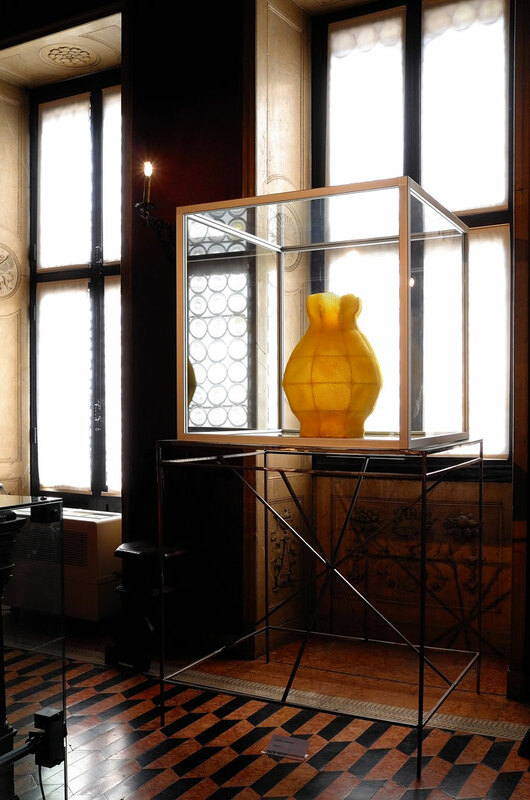 ''Martha Hertford Vase'' in beewax designed by Tomáš Libertíny and produced by bees. Photo by Tatiana Uzlova. 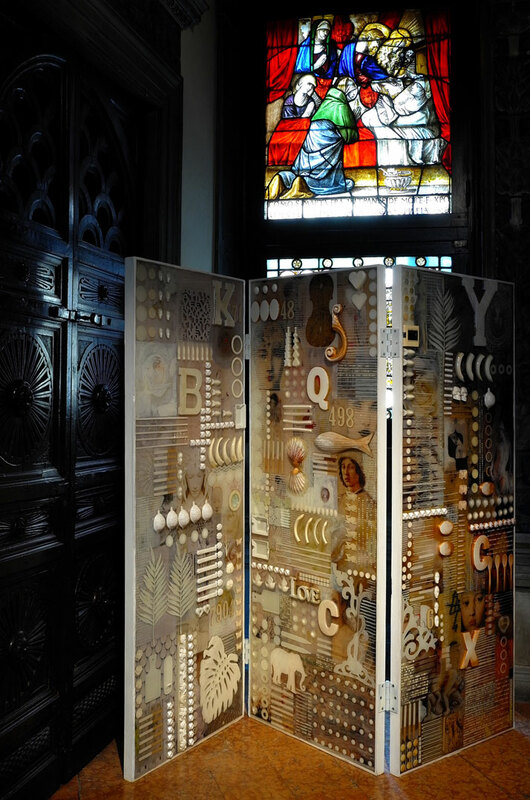 Room divider by Emanuela Crotti. Photo by Tatiana Uzlova. Transmission Lamp by Studio DeForm (Czech Repubblic). Photo by Tatiana Uzlova. 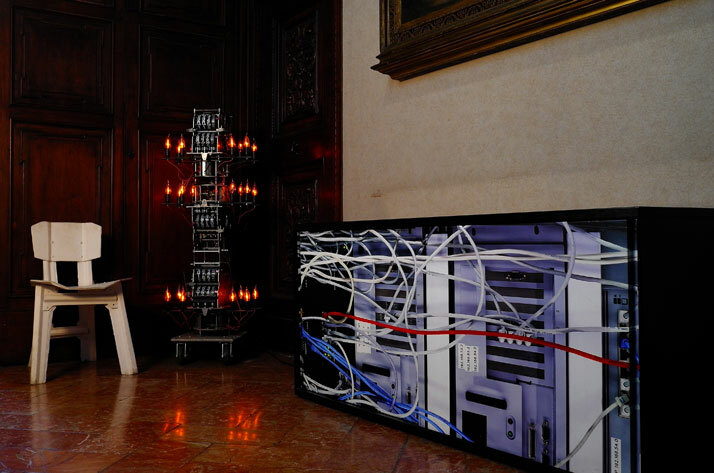 Diffusor Cabinet by Dirk Vander Kooij. The cabinet has been designed to absorb noises. The shape of the piece is not defined by the designer But by a mathematical calculation. Photo by Tatiana Uzlova. Transmission Lamp by Studio DeForm (Czech Repubblic). Concrete Sofa, by JamesPlumb. Photo by Tatiana Uzlova. Pump It Up by Nacho Carbonell. Photo by Tatiana Uzlova. Medium Mobile by Nacho Carbonell. Piece Unique 2013. Photo by Tatiana Uzlova. 'Just About Now' By Maarten Baas with Laikingland. A sand timer that indicates the passing of time with the sounding of a gong. Photo by Tatiana Uzlova. 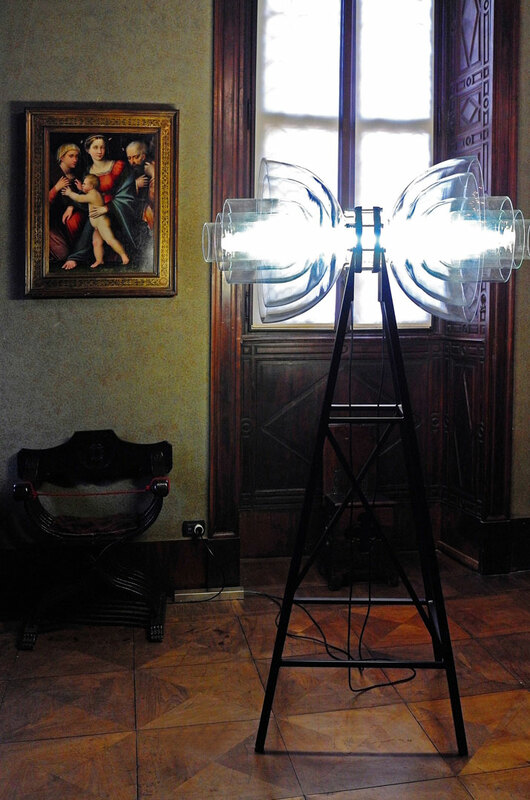 Floor lamp by Giampiero Milella and cabinet by Massimiliano Locatelli. Photo by Tatiana Uzlova. 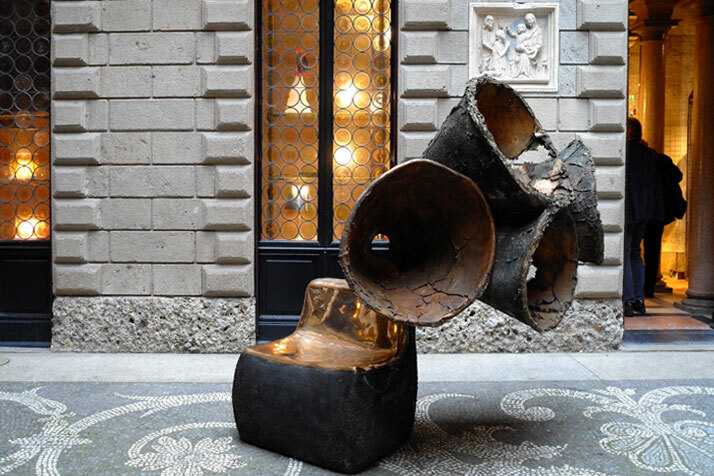 Auditorium, bronze piece, 2011 by Nacho Carbonell. Photo by Tatiana Uzlova. 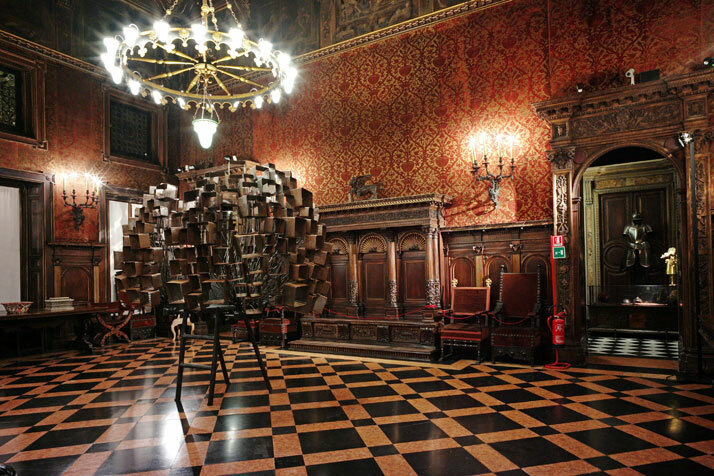 The Library Chair by Nacho Carbonell. Piece Unique 2013. Photo by Tatiana Uzlova. 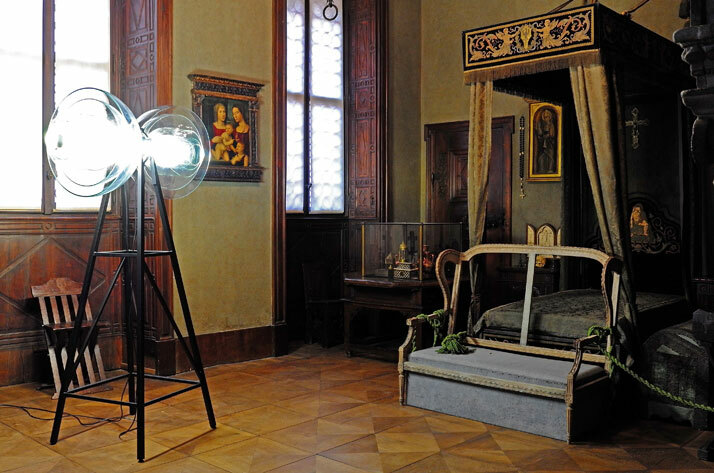 Floor and table lamps by Enrico Marone Cinzano. Photo by Tatiana Uzlova. ''Yellow Mobile'', prototype ceiling light by Front Design. In Situ Araldic (on the right) by Frederique Morrell. Photo by Tatiana Uzlova. 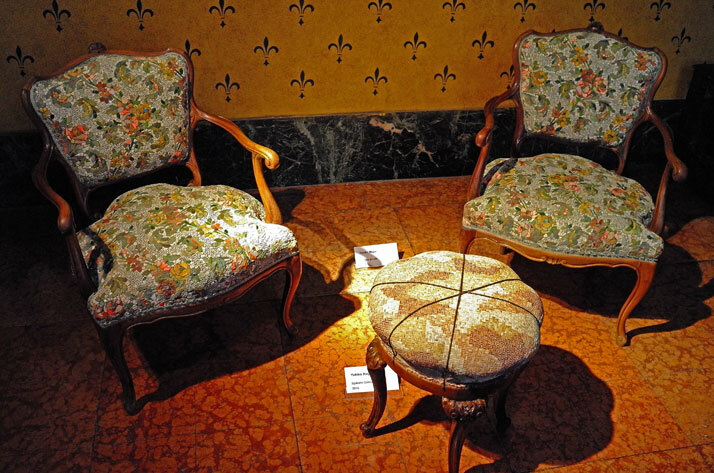 Twin Armchairs by Yukiko Nagai. Old armchair and mosaic seat and back. Photo by Tatiana Uzlova. 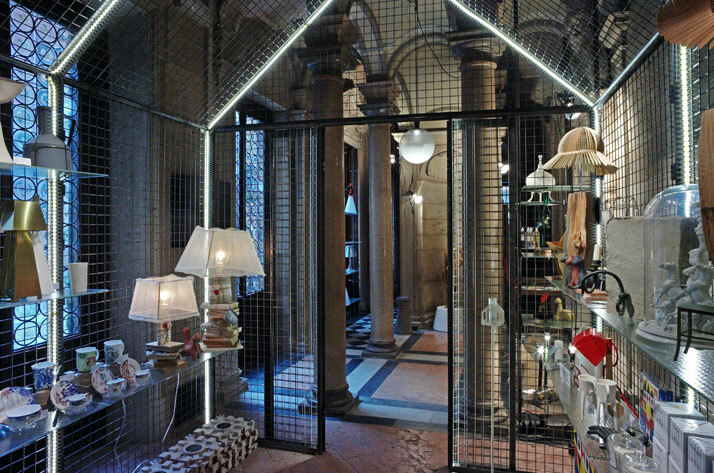 Bagatti Valsecchi Design Shop by Rossana Orlandi . Project curated by Massimiliano Locatelli – CLS architects. Photo by Tatiana Uzlova.